Each month the Anoka Knights of Columbus choose a family that models Christian family values and visibly live by them every day. The family chosen for January 2019 is the Deacon Ramón and Suzanne García family. The García family is blessed to have their entire family involved in parish life, service and ministries. 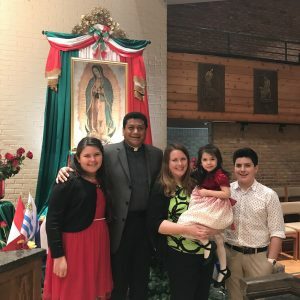 Even before they were married just over 21 years ago, Deacon Ramón and Suzanne have been living out their Catholic faith, first as a couple, and now as a family of five. Deacon Ramón is the coordinator of Latino Ministry at St. Stephen Catholic Church, and Suzanne is on staff part time, coordinating the Latino choir and assisting in all of the aspects of Latino ministry, alongside her husband. She is also a Spanish teacher at Our Lady of Peace Catholic school. The Garcías have three children. Their oldest son attends Chesterton Academy, their oldest daughter is in sixth grade at Annunciation, and their youngest daughter just started pre-school. The older two siblings are both altar servers and are involved in numerous parish activities. The youngest child will surely discover her niche in parish life very soon! As a family, they serve at mass each Sunday, visit the sick in hospitals, do home visits, pray together, evangelize together and they try each day to live out Catholic values. The family enjoys camping, walking around Lake Nokomis, visiting Deacon’s family in Mexico, and watching movies together. The Garcías are in their 10th year of ministry at St. Stephen’s, and Deacon Ramón recently celebrated his 10th anniversary as a deacon. They are blessed to have a multicultural, bilingual family, to be able to live out their faith together, and to be part of such a wonderful community at St. Stephen’s.